BANTAYAN ISLAND, CEBU -- Rocky Fuentes has successfully defended his Philippine Flyweight Title here last night at the Bantayan Multi-Purpose Center with an 8th round knockout victory over Louie Bantigue of their 12 round bout. 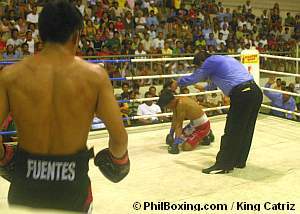 Fuentes also scored a knock down in the 6th round. After receiving a barrage of body shots, Bantigue went down for the second time in the 8th round and stood up before Referee Ben Necesario reaches the count of 10. Necesario however waived Bantigue out when he saw Bantigue was unfit to continue under the protestation of Bantigue's corner. Fuentes, who bounced back from his split decision loss to Richie Mepranum in his last fight at the Araneta Coliseum in December last year, has now improved his win-loss-draw record to 21-6-2 with 12 KOs. Bantigue has dropped to 11-10-5 4KOs. In the undercards, Fernando Otic won by 2nd round TKO over Jesar Ancajas and Joel 'Yao Ming' Zapa won by unanimous decision over Arnel Baricuatro. Despite the unstable weather, the Bantayan card was a big success with the warm cooperation of the people of this beautiful island. The fight card was promoted by Ala Promotions in cooperation with the municipality of Bantayan. 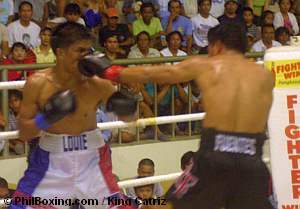 Top photo: Reigning Philippine flyweight champion Rocky Fuentes (L) stands in a neutral corner as Referee Ben Necesario administers the count to the fallen Louie Bantigue. Fuentes (R) tags Bantigue with a left straight. 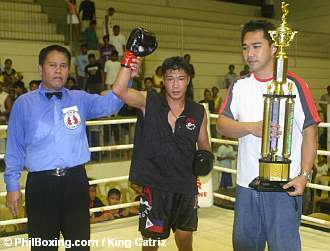 Referee Ben Necesario (L) raises the hand of Rocky Fuentes in victory as host Chad Cañares holds the trophy. 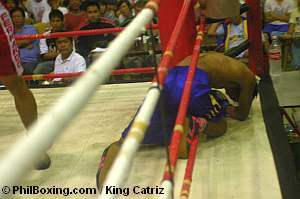 Jesar Ancajas almost fall out of the ring from Fernando Otic's power punches. Click here to view a list of other articles written by King Catriz.